Cycling is fun, but doing so at night is definitely more dangerous than during the day as visibility drops to extremely low levels. Hence, you ought to do everything in your power to make youself visible to other road users. This is where the Pedalite Pedals come in. Pedalites are the latest cycling phenomenon and are, to put it bluntly, uber cool. These kinetic energy powered (no batteries, ever!) 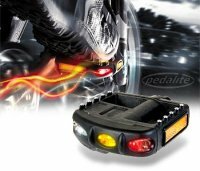 360 degree light-up pedals simply replace your boring old pedals, and light your feet up like a Christmas tree. As well as standard reflectors, the pedals have three integral bright LEDs, one facing forwards, one backwards, and one sidewards – or rather sideways. As you pedal, kinetic energy powers up the LED’s which flash brightly away, and the great thing about these is that this energy is stored in the pedals, so even as you free wheel or stop at a crossing (of course you do…) the pedals continue to flash for up to five minutes! I’d definitely feel safer having a pair of these on my bicycle. What’s £34.99 when it comes to preventing an accident?